Flashback to last week. We left Blenheim on Thursday and got as far as the sandhills by the mouth of the Waima/Ure River. 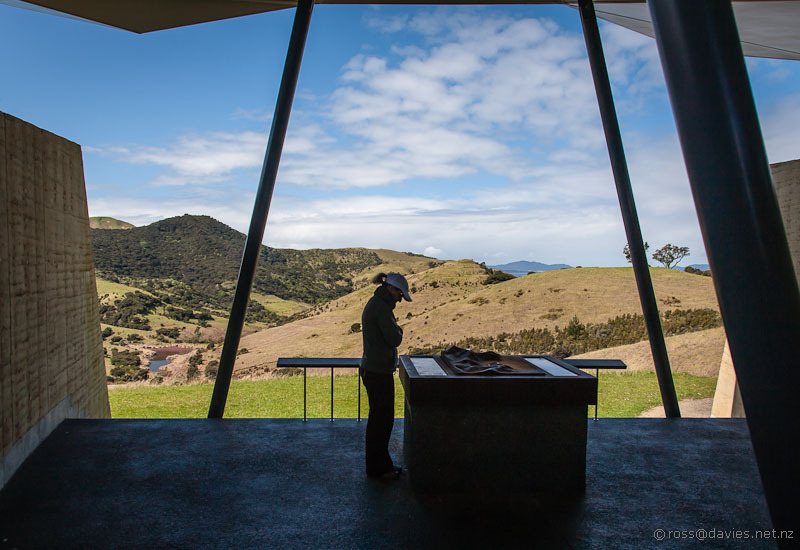 About 8kms south of Ward and 2 kms north of Wharanui – not that you’d ever know that you were at Wharanui. And what’s with the Waima/Ure name. Why can’t people make up their mind what to call a river? Anyway, our DoC pamphlet told us that the Sawcut Gorge was up the Waima/Ure valley so it was a perfect place to park and spend the night. Suzi in the sand dunes at Wharanui. We woke to a good morning – although maybe any Friday morning not at work is a good morning? 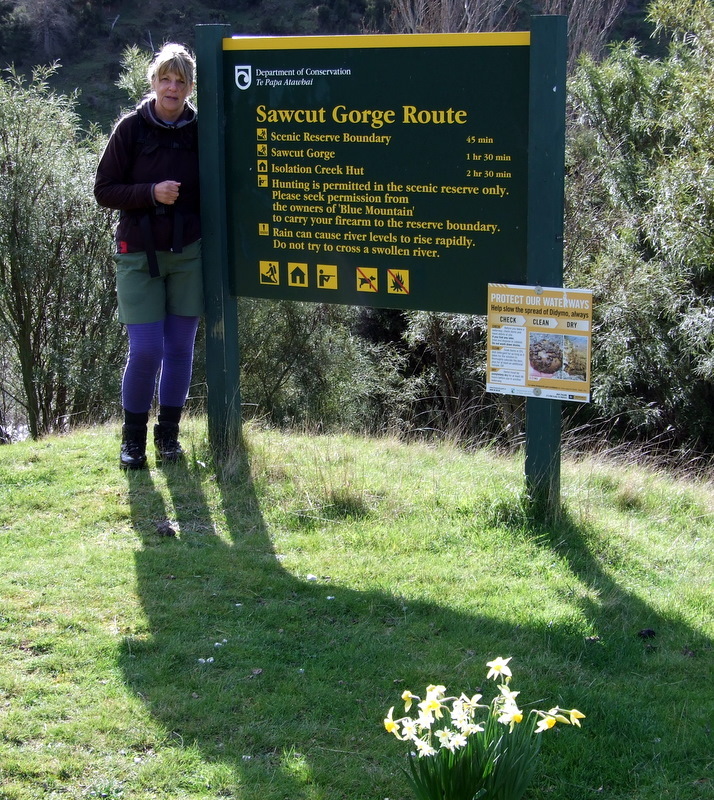 Our pamphlet suggested that it was an hour and a half’s walk to Sawcut Gorge so we figured we’d not need to take our lunch. Big mistake! And we figured we’d definitely be back by 2pm. Since we were heading off into the wilderness I decided we’d better tell someone so texted my son Michael to say where we were going and that we’d be back by 2pm. Bigger mistake! We sorted out our boots and walking poles and day-packs and even had a quick walk on the beach. It was after 9am by the time we were ready. It looked quite simple on the map. Wyn crossing the Waima/Ure River. This was one of the easier crossings. Looking up the Waima/Ure River. We set off up the valley in the car. There is no sign off SH1 indicating what lies up the valley. Apparently they don’t want too many people visiting. The drive in is spectacular enough as the valley gets smaller and the road zig-zags up a hill. Eventually it ends at a farm house and that’s where we had to park. It started to get a bit rougher and gorge-like - and we were still in the Waima/Ure River. The land-owners are very generous in allowing people to cross their land. Not to mention allowing people to park in their driveway. 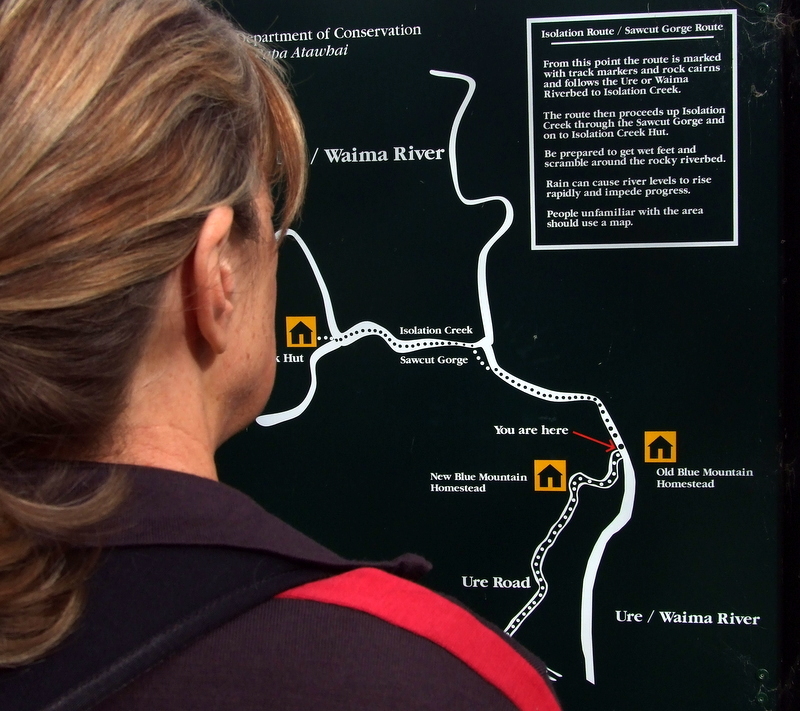 We had a bit of a chat to a friendly woman who told us some of the orange track markers in the river were missing but to just keep going until we got to a scenic reserve sign and we’d be at the side valley that is Isolation Creek. 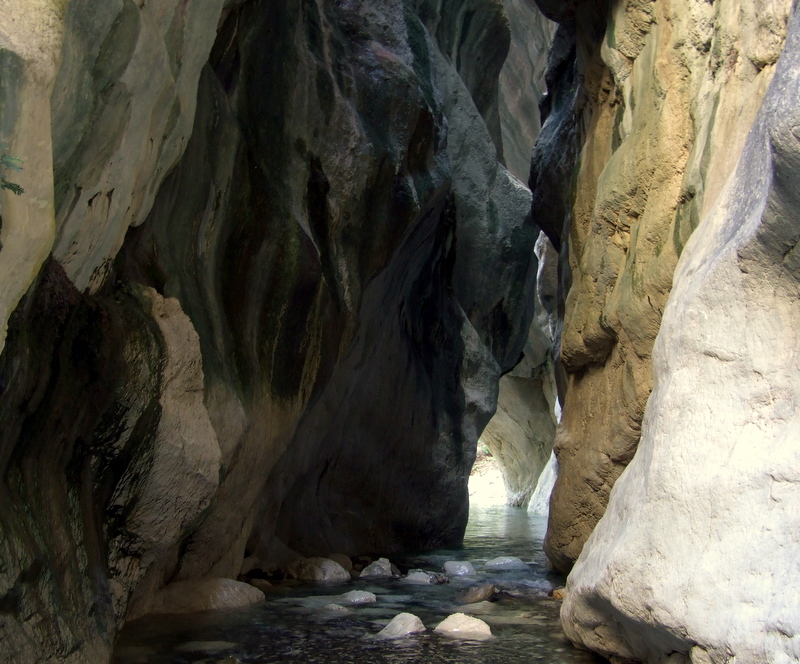 Sawcut Gorge is in Isolation Creek. She also said that we’d get wet feet and that some of the crossings higher up would be knee deep. The pamphlet said to head up the river bed for an hour or so and after a few crossings we’d be at Isolation Creek. My how we laughted at all this as the morning went on. The Waima/Ure River valley is spectacular enough itself. At last! 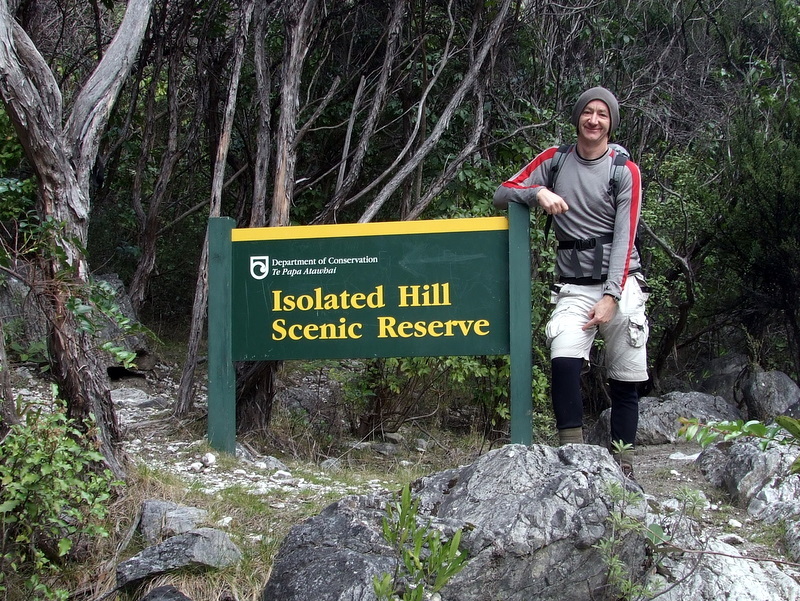 We reached the scenic reserve sign near Isolation Creek. I'm showing the tide mark on my shorts - we'd been a bit more than knee deep on some crossings. As soon as we reached the river bed we had to cross, and that one was knee deep. And cold. For a start the river bed was easy going even if we did have to keep crossing. There were some orange markers but there were gaps when we had to guess which side was easiest for walking. And it soon became apparent that this was not a walk. It is a tramp – at least it is at this time of year. There is lots of evidence of floods and I think they has quite a few this winter. And we guessed that snow melt was keeping the water levels up and the temperature down. We walked and we tramped and we crossed and we waded and we bouler-hoppped and we crossed and we jumped. We stopped after three quarters of an hour and I wondered if we were almost at Isolation Creek Luckily we didn’t know how much further on it was. The valley started to get confined after that and became a spectacular gorge in its own right. There were tracks over and around the worst bits although some of these had taken a beating from floods by the looks. Wyn picking her way up Isolation Creek. We started to lose count of the river crossings by the time we got to double figures. Our feet were freezing as we sloshed along with bootfuls of river. Wyn had a couple of goes at emptying her boots out but it was futile as we’d soon need to cross again. 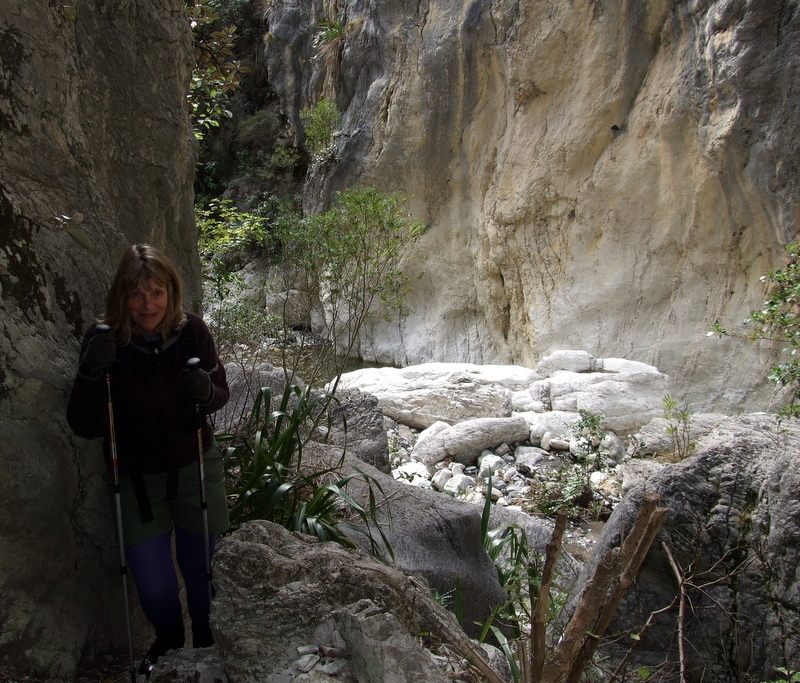 Most of the crossings were OK and we happily picked our way across using our walking poles. But there were a couple where we linked up for mutual support. These were ones that were narrower and swifter with a boulder bed. As the water levels headed upwards we laughed about the advice about it being up to our knees. That would have been luxury. Ross - looking up Isolation Creek which was getting a bit narrow in places. Looking down Isolation Creek. We hadn't even reached the real gorge yet! Eventually after almost two hours on the move with only one 10-minute stop along the way we finally reached the sign indicating the boundary of the Isolated Hill Scenic Reserve. This also marked where Isolation Creek comes into the Waima/Ure River. Time was getting on but we kept on, hoping that Sawcut Gorge was only 30 minutes away as the pamphlet promised. The valley seemed to come to an end but there's a crack in it. It dawned on me that the crack is Sawcut Gorge. Spot Wyn walking towards it. Wyn at the mouth of Sawcut Gorge. Progress up Isolation Creek seemed a bit quicker. 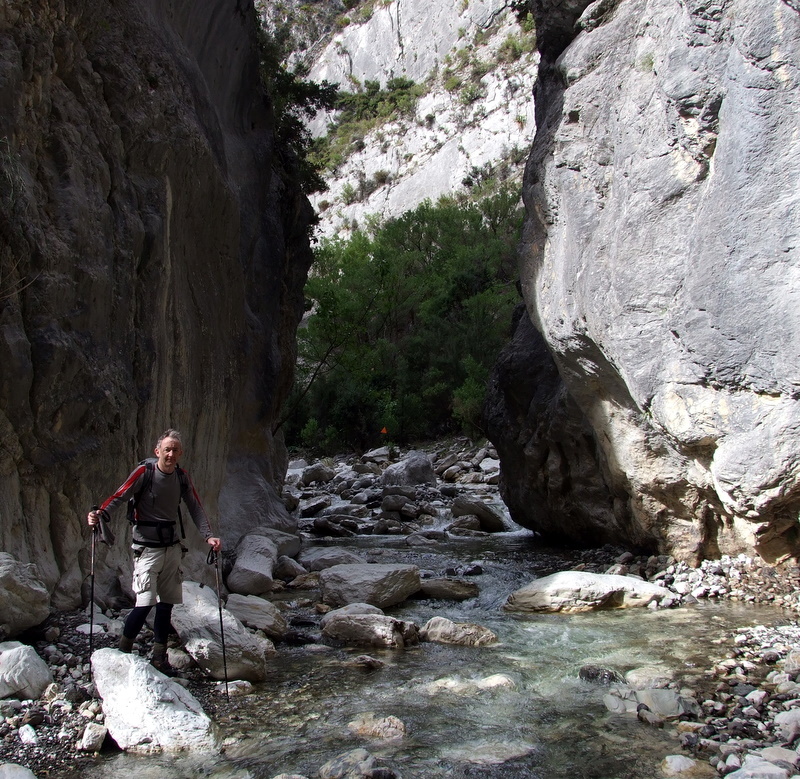 It rapidly became even more of a gorge and there were tracked around some of the worst bits. Otherwise we just splashed up the creek where there was no alternative. The water seemed warmer although we were not sure whether this was just a sign that we’d lost the feeling in our feet altogether. After a bit less than 30 minutes the valley seemed to come to an end – a bit of a box canyon. Except this one had a big crack at the head of it. 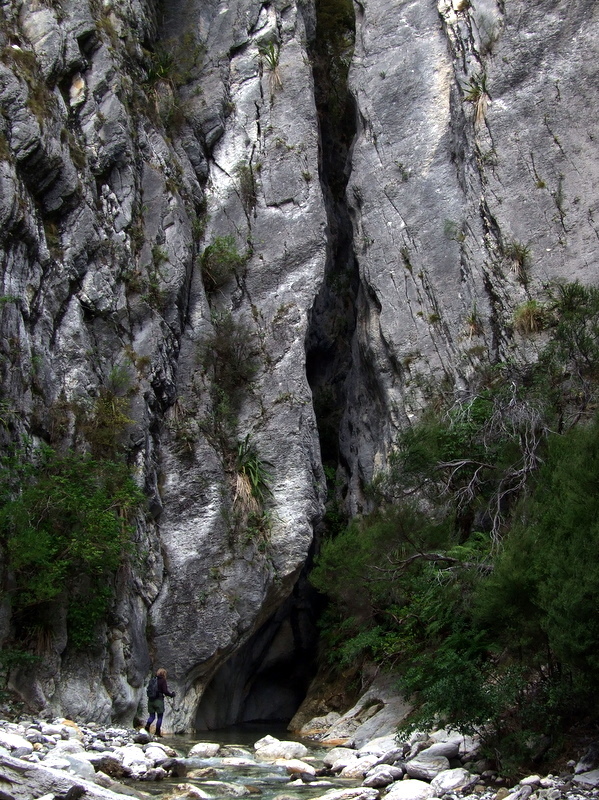 It took a while for my brain to work out that the big crack was actually Sawcut Gorge. 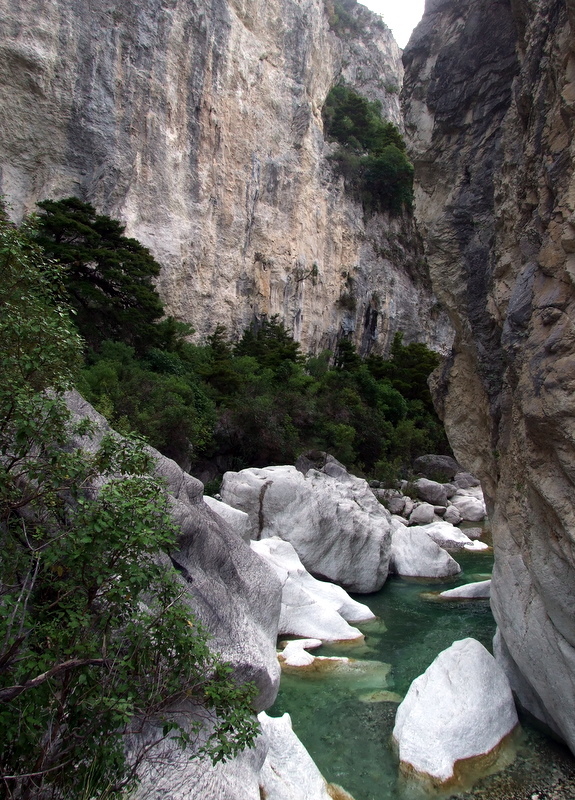 Isolation Creek flows through Sawcut Gorge. 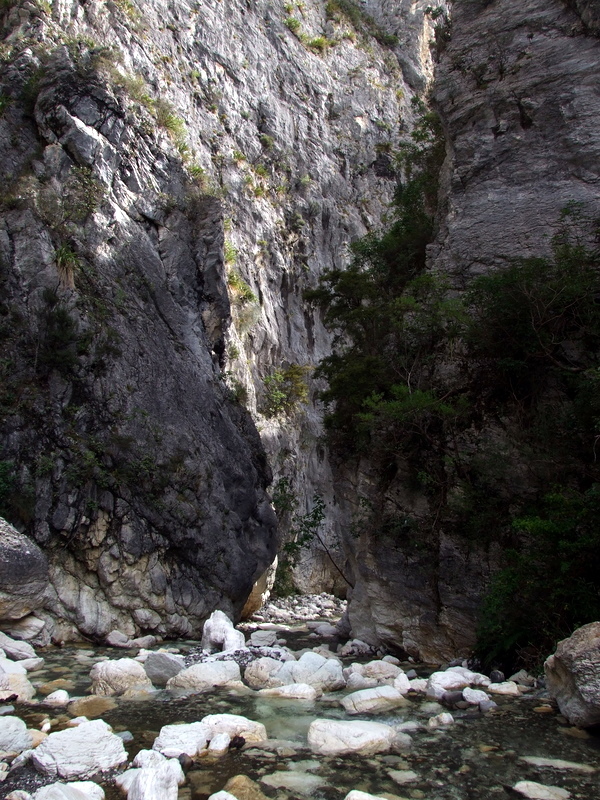 Somewhere it says that the gorge is 150m high at its highest, and 2m wide at its narrowest. It is awesome, incredible, overwhelming, impressive, amazing, spectacular, and a bit scary. This was one of those places where the brochure undersells it. It comes as a surprise no matter what. It was well worth the effort in getting there. Looking down Sawcut Gorge towards the entrance. Wyn walking through Sawcut Gorge. I'm leaving this photo full size as it's one I'm very happy with. Wyn back at the start. Both of us were happy to be back at the car and out of the river bed. We paddled our way up the creek through the gorge and after about 100m or so it started to widen out a bit. Apparently sometimes it can be a bit deep in the gorge but it was fine for us. We emerged into the sunshine on the other side and had a quick peek up the valley. 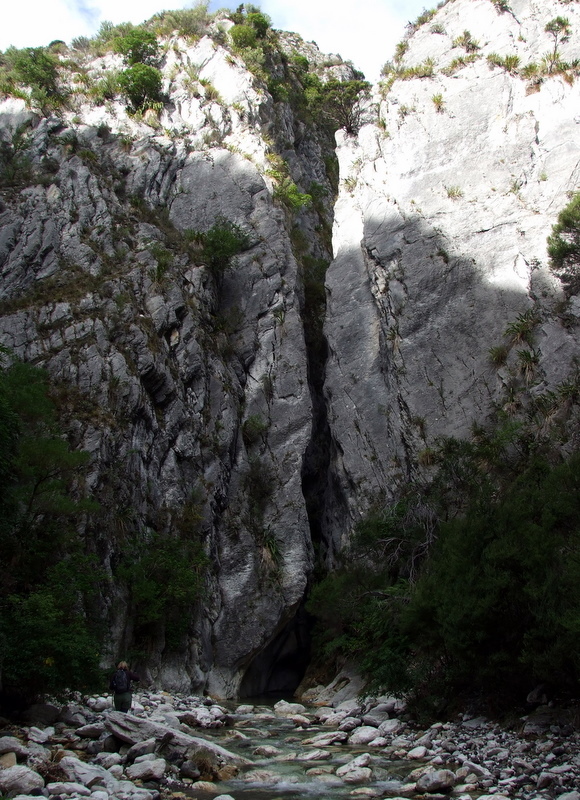 It widened out into what was a more normal gorge. An hour further up there is a hut but it was time for us to retrace our steps. The day was getting on. We stopped in the sun for a couple of meusli bars – the best we could do for lunch. I dug out my lightweight tripod and balanced it on a rock standing in the middle of the stream and took a few photos to try to capture the impression inside the Sawcut Gorge. I must have been lucky with the light as a couple came out OK and one came out good. 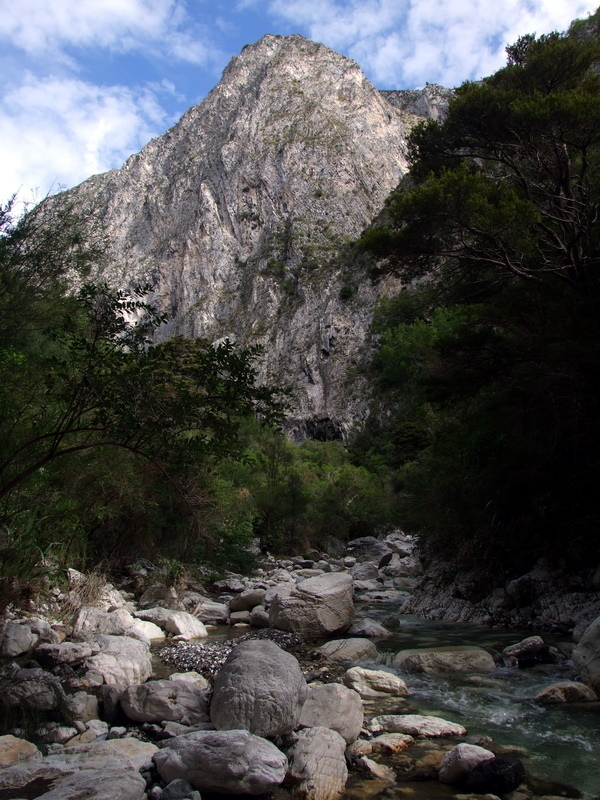 We emerged back into Isolation Stream and what was merely a spectacular gorge. We were a bit quicker finding and navigating the bits of track that existed and it didn’t take too long back to the main river. We made better progress down but there was still one stretch where we had to cross twice and we had a couple of goes at the second one – linking arms and backing out of our first attempt. We started to warm up a bit and there seemed to be a bit of a warm breeze up or down the valley. We found one bit of track we’d missed on the way up which made up a bit of lost time. We eventually emerged back at the car about 5 hours after we had left. The sun was shining at it was a lovely afternoon – after 3pm. It was so nice to get out wet boots and socks off our soggy cold feet. We were worried that Michael might be worried so drove off down valley until we got mobile phone coverage (1 up to Vodaphone here) and gave him a ring. Luckily he’d been busy at work and wasn’t worrying about us which was a relief. We zoomed back to Suzi for a quick shower and late lunch. I sorted out the A-frame and attached it to the car. Having done all that a bit of a heave on it as a final check indicated that all was not well. One of the towing brackets on the car seemed to have more movement than it should. We’d made a sharp turn off SH1 when we arrived and maybe had damaged it – again! I decided not to take any risks so had to take it off again and pack it away on the car roof rack. Wyn would have to drive the car separately until we could get it checked. We’d been dreaming of a nice hot coffee at The Store at the cafe down SH1 towards Kaikoura as we were wading down the river. The afternoon was getting on and we were worried that they might be closing. So Wyn zoomed ahead in the car and I was pleased when I pulled up a little later to see that she was inside getting in the coffees. It’s a great place with its views over the sea – and a real fire in the grate. 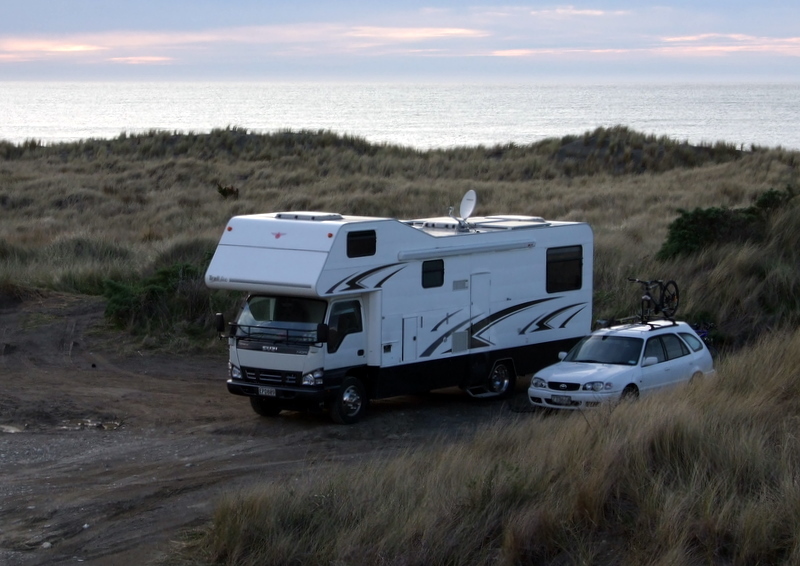 Eventually we continued south and parked up at Paparoa Point, between the road and the sea on a rocky outcrop. We were soon settled in and sorted out for a night beside the sea and the seals. It had been quite an adventure. 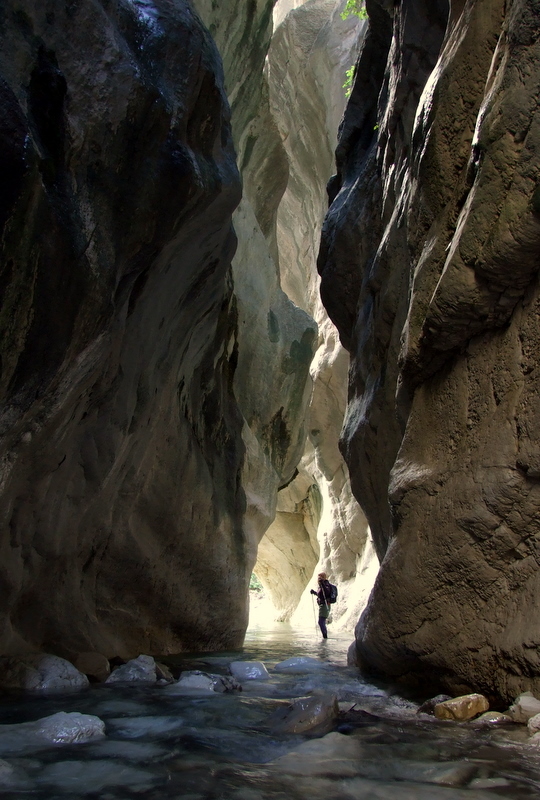 The gorge photos are particularly stunning – well worth the wet feet. Thanks Ju. Yep, it was one of those days when getting there made you forget the journey. 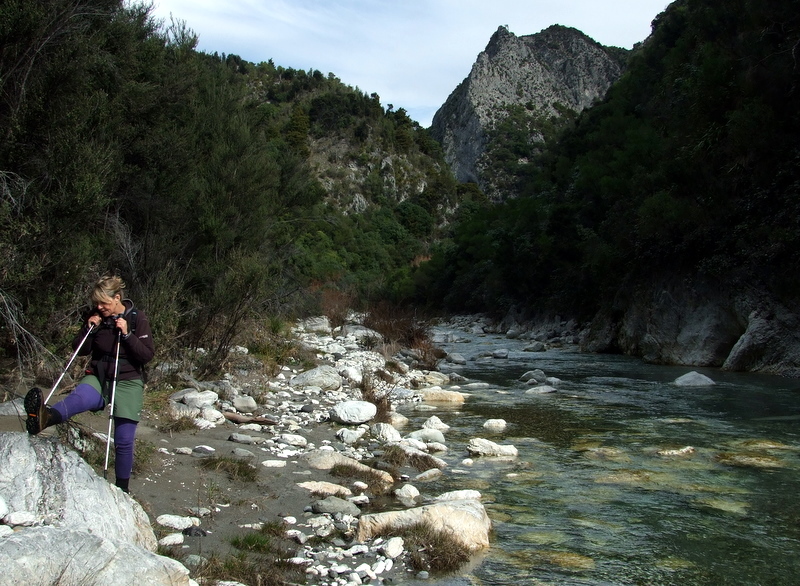 The tripod I took was my older very-lightweight Kathmandu one – but just fine for using on a rock in the middle of a stream. 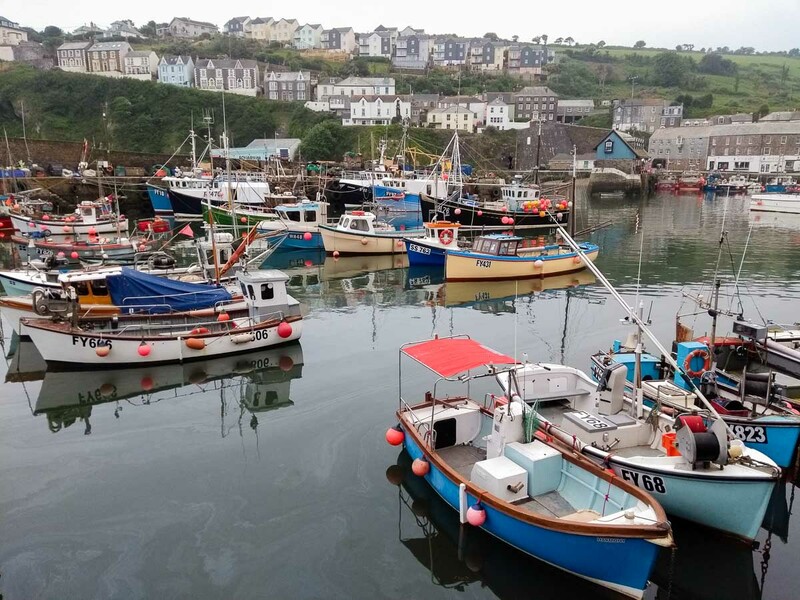 Great to see your photos – we walked up there on Christmas Day several years ago and were even tempted to stay out in a hut for the festivities. Glad to see it still seems well off the beaten track and a bit unknown – we saw no one, but then it was Xmas!! Been there 3 times o. On the first visit we were lucky enough to hit it at precisely the right time. The sun was in a position for about 10 mins where it shone down in such a way that the walls of the gorge all turned iridescent blues and green hues! A sight that for me was far superior to the Standley Chasm in Central Australia. Never had the timing right again! Truly a once in a lifetime experience. Sounds magical. We are wondering how the earthquakes in recent weeks have changed the valley and possibly the gorge. 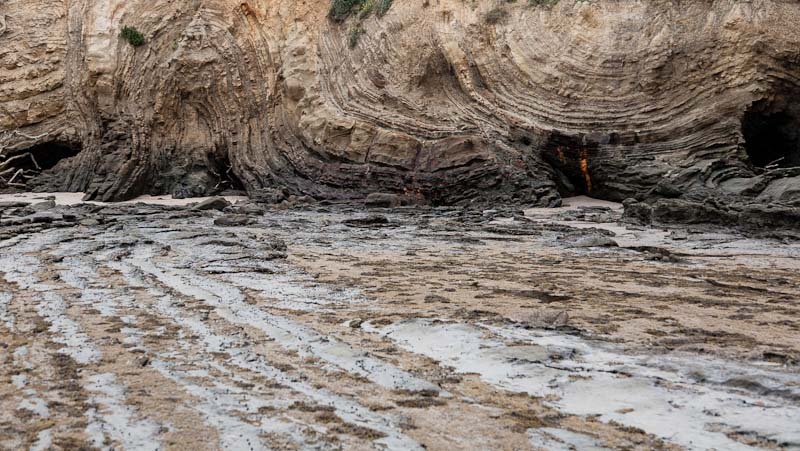 The land is so disrupted that there will be effects but I can only hope that the gorge itself remains somewhat intact. Meantime thanks for sharing your experiences. Yes Ross, that’s what lead me to the article. I have been trying to find out the state of the NP. Every time I go back to NZ I try to introduce my new family members to that Jewel of our wonderful country. 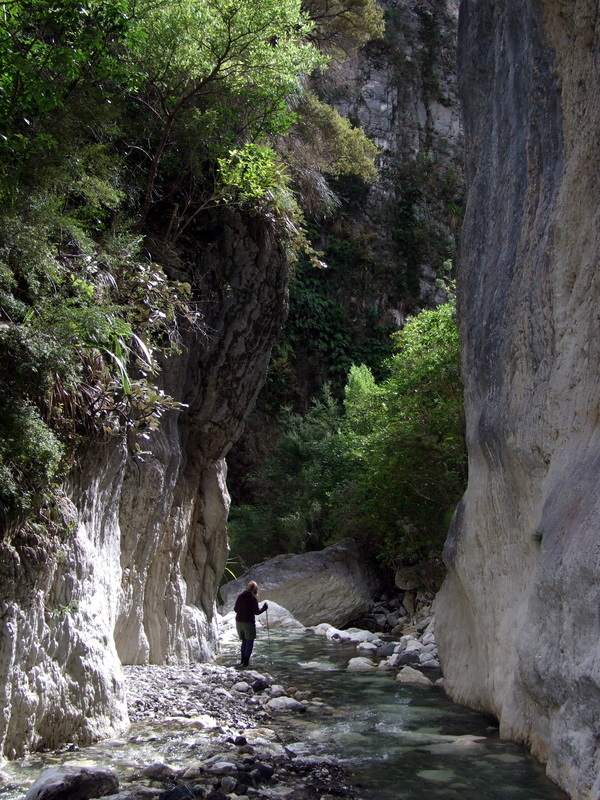 At the start of this year I was going to show our new daughter in law the gorge on a trip south from Motueka. Because of the weather we decided to go through the Lewis and back up the WestCoast. I have promised her to do the walk in next family trip over. I’m crossing fingers for it to still be intact. By the way it is a great article!